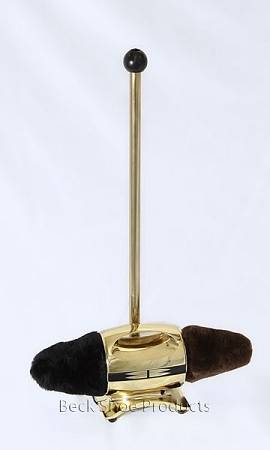 Beck Electric Shoe Polishers are a beautiful design and will fit into any office, bedroom or lobby. The USA Made Beck Polishers motor housing is a durable die-cast zinc alloy, built to last for generations. The motor is the strongest motor of any free standing shoe polisher on the market. Each buffer pad is made by hand and 100% lambs wool, the softest and best quality brushes for your shoes. Beck has been building polishers for over 40 years so you know you will always be able to get replacement buffer pads. Feel free to give me a call if you have any questions. The Diplomat model has a handle with the push power button. As long as you hold in the button the buffer pads will spin. This model is perfect for shining your shoes while they are on your feet. Great way to touch your shoes before going out each day or before any meeting.